My hubby is a thrill seeker and loves a good adrenaline rush. I had the opportunity to feed his need for thrills with a review of one of Xperience Days unique gifts. Xperience Days offers a sorts of fun experiences you can purchase for your loved one. From wine tasting, airplane rides, fishing and tons more you can give someone you love an amazing gift that they won’t forget. Back to my hubby, thrill seeker and adrenaline junkie. While he isn’t a massive NASCAR fan he does like to watch and even more he loves speed! 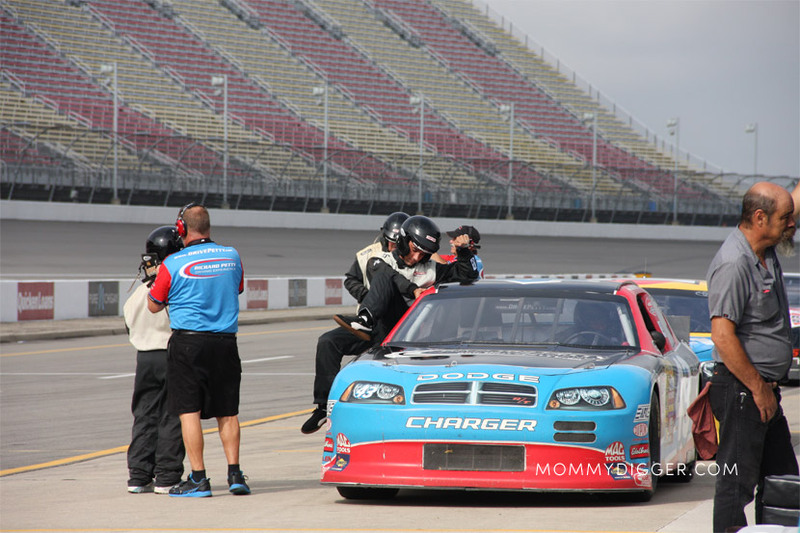 So, when I saw the experience to drive in a NASCAR I knew he’d be completely thrilled. A few weeks ago the day came for his driving experience and off we went to the track. The whole car ride to the track I could just feel how excited and anxious he was to hit the track. We arrived at the racetrack and it had just rained a bit so we hung out at the track together watching the jet engine dry off the track. While we were waiting we all got to sit in the NASCAR stock cars! Then they took Pinky and me on a ride around the track in a van 🙂 So while we didn’t hit 80 mph we can still say we’ve been on a race track! Once the track was dry it was time for Daddy Digger to suit up! The NASCAR pulled up he put on his helmet and hopped right on in. He reached about 200mph and those three laps went so fast. He had an amazing time and won’t ever forget it! I’ve been at tracks and races all over the country but nothing tops coming in hot out of pit row and just burning through that circle. I’ve had my fair share of 9-10 second quarter mile car runs too, that’s fun too, but 200 mph in and out of apex turns with those g-forces, that’s going to be a tough one to beat and a story your husband will tell everyone he can (like I did). I don’ t care for speed myself but that looks like an awesome experience! Xperience days are amazing. You can do things that you wouldn’t normally get the chance to do.